As part of their first official overseas tour, the Duke and Duchess of Sussex spoke to crowds at the city"s college, who lined up eagerly behind barriers in hopes to catch a glimpse of the royal couple. Upon greeting the riveting audience, the Duke of Sussex told them: “I’m going to try to shake as many hands at once!" In response, several people stuck their hands out to greet Harry, as many whipped out their phones to capture the prince on camera. Praising the crowd"s multitasking skills, Harry said: "With one hand and a phone!" The Duke created a commotion, as many tried to reach out to the prince"s hand while filming the scene. He even joked with one woman, and said: "That"s not your hand!" 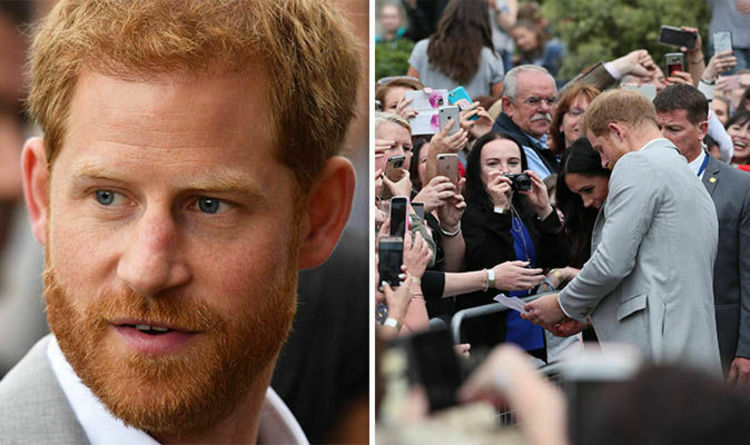 Hundreds of people gathered at the college, located in Dublin"s city centre, in hopes to meet Meghan and Harry during their riveting royal visit. He even joked about keeping the artwork. Meghan was also quick to interact with the crowds, taking her time to engage with residents and speak to them on a personal level. In a clip, Meghan revealed to fans that she missed her hometown, Toronto, saying "it"s a great place". She also told a woman, named Jeanette, that her grandmother shared the same name with her. The Duke and Duchess of Sussex visited Dublin in their first official overseas tour since the royal couple were married in May. During their trip, Meghan and Harry met the president of Ireland, visited children at Croke Park and also paid cultural visits to the EPIC Museum of Irish emigration. The pair also visited the famine memorial on the bank of the River Liffey, whose the statues commemorate the Great Famine of the mid-19th Century, where almost 1 million people died following a potato shortage, a main food source the Irish survived on. The Duke and Duchess returned to London on Wednesday evening, and are set to embark to Australia Fiji, the Kingdom of Tonga and New Zealand this autumn.